Wedding Reception Planner – personal, one-on-one planning with you to create the reception you've always dreamed of. Master of Ceremonies – making introductions and any announcements you wish to keep you and your guests informed as the night goes on. Reception Coordinator - coordinate the evening with all of your reception vendors including your caterer, photographer, videographer, and any other vendor to make certain your reception runs smoothly. Time Manager – I'll watch the clock so you don't have to. You can just sit back, relax and enjoy your reception with your family, friends, and other guests. 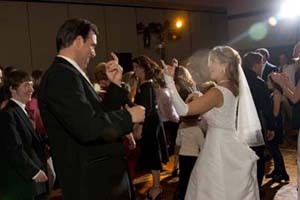 And, of course, your DJ...playing the music that keeps you and your guests out on the dance floor from start to finish! Here is my wedding reception philosophy…it's your day not mine and the spotlight should be on you not me. That's how I approach the planning process, too. Every wedding reception is unique and, using a structured planner, I will work with you to plan all the details of your wedding reception to your specifications. I know that you want your wedding reception to be perfect...so do I! I would welcome the opportunity to let my experience and skills work for you in planning a wedding reception that you and your guests will be talking about for years to come! Please contact me today to set-up a no-obligation consultation to find out how I can help you turn your vision of a perfect wedding reception into an occasion you will never forget! Don't Live In The Pittsburgh Area? Do you live out of the Pittsburgh, PA area but are planning to have your wedding and reception locally? Some of the comments on my references page are from couples who were in that situation…looking for a DJ in the Pittsburgh area while living in Detroit, Washington D.C., or as far away as San Diego, CA! You can rest assured that I have experience in helping couples plan from afar and will make your long distance planning as easy as possible!